Coming into the 1974 NFL season, the Buffalo Bills appeared to be a team on the rise. Following six straight losing records, the Bills had gone 9-5 in ’73, just missing out on a playoff berth. A key to the club’s improvement had been the return of Lou Saban as head coach in 1972 (he had coached the team from 1962 to ’65, during which it won back-to-back AFL titles), and his decision to build the offense around HB O.J. 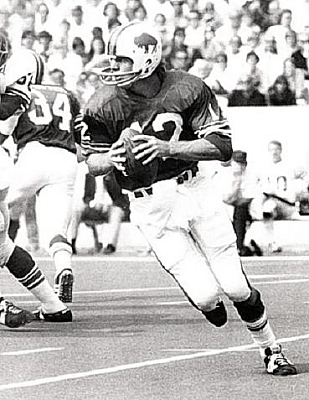 Simpson, who had been something of a disappointment after coming out of USC in 1969. The decision paid off in back-to-back league rushing titles by the star halfback, including a record 2003 yards during a sensational 1973 season. At quarterback in ’73 had been rookie Joe Ferguson, a third round draft choice out of Arkansas who threw just 164 passes during the course of the year. Thus, the offense had been decidedly one-dimensional with Simpson, behind an outstanding line, carrying the load and the improving defense that included DE Earl Edwards, LB Jim Cheyunski, and CB Robert James keeping opponents from scoring often. For the team to advance, Ferguson would need to throw the ball, and to help in this regard Saban dealt for WR Ahmad Rashad (pictured above) from the Cardinals to join the capable holdovers J.D. Hill and Bob Chandler. The Bills opened the ’74 season at home on September 16 in a Monday night contest against the Oakland Raiders. Oakland, under Head Coach John Madden, was a perennially contending team that had yet to win a title since the AFL merged with the NFL. They were coming off a 9-4-1 record in 1973 and were still a formidable challenger. Ken Stabler had bypassed Daryle Lamonica as the starting quarterback and he had veteran WR Fred Biletnikoff plus up-and-coming WR Cliff Branch to throw to, FB Marv Hubbard to hand off to, and a tough defense to harass opponents. There was a big crowd of 79,791 on hand for the nationally-televised game at Rich Stadium. Following a scoreless first quarter, Buffalo scored on Ferguson’s four-yard TD pass to J.D. Hill. It capped a 54-yard drive that benefited from a spearing penalty called on Oakland DB Warren Bankston. Early in the second quarter, George Blanda, on the eve of his 47th birthday, kicked a 47-yard field goal for the Raiders. That was it for the first half scoring, but an ominous development occurred for the Bills in the final minute of the second quarter when O.J. Simpson suffered an ankle sprain and was sidelined for the second half. In the third quarter, the Raiders drove 58 yards on their first series and HB Clarence Davis ran for a 15-yard touchdown on a third-and-nine play, surprising the Bills defense in an apparent passing situation. A big play along the way was a 14-yard Stabler pass to Branch in a third-and-nine situation at the Buffalo 34. Seven minutes later, Oakland added to its tally with another Blanda field goal, this time from 41 yards. The Bills fought back on offense and advanced into Oakland territory, but a 46-yard field goal attempt by John Leypoldt was wide to the left in the waning seconds of the period. The Raiders held a 13-7 lead heading into the fourth quarter. Early in the final period, Stabler was picked off by FS Tony Greene, giving Buffalo possession at the Oakland 36. Nine plays later, the Bills faced fourth-and-goal at the one and Coach Saban chose to go for it. They came up empty when LB Dan Conners of the Raiders halted Simpson’s replacement, HB Gary Hayman, with a hard hit for no gain and knocked him out of the contest as well. Buffalo got the ball back in good field position at the Oakland 41 following a punt by the Raiders after their ensuing possession, but the Bills came up empty again when once more they failed to convert a fourth down, this time on a pass at the 25. However, following a fumble by Marv Hubbard at his own 33, and with 1:56 left in the game, Ferguson threw to Ahmad Rashad for an eight-yard touchdown, finally coming through on a fourth-down play. Leypoldt’s successful extra point made it 14-13 in favor of the Bills. Buffalo’s spirited defense held the Raiders as Stabler threw three incomplete passes. The offense regained possession on its own 31, but on the first play FB Jim Braxton fumbled and DT Art Thoms picked it up and ran for a touchdown. With 1:14 now remaining, Oakland was back in front at 20-14. Following the kickoff, the Bills took possession at their 28 and put together an eight-play, 72-yard drive that was helped along by two penalties on the Raiders. Ferguson, who completed four passes during the series, again went to Rashad for a 13-yard touchdown and, with the successful PAT, a one-point lead with the clock down to 31 seconds. The Raiders fought back, going from their 41 to the Buffalo 33 in three plays. But with six seconds left, Blanda missed a 50-yard field goal that fell short and was wide to the right. Having come through in an exciting last two minutes of play, the Bills won by a final score of 21-20. Buffalo led in total yards (306 to 252) and first downs (22 to 18). The Raiders suffered two damaging turnovers, to one by Buffalo, and penalties were a big factor as Oakland was flagged 10 times at a cost of 104 yards, often in critical situations. Joe Ferguson (pictured below) completed 10 of 20 passes for 122 yards and three touchdowns with none intercepted – in the fourth quarter alone, he was 6 for 12 and 84 yards with two TDs. He picked on Oakland CB Skip Thomas, although the winning touchdown was scored on All-Pro CB Willie Brown. In his half of play, O.J. Simpson rushed for 78 yards on 12 carries. In picking up the slack, Jim Braxton ran 19 times for 69 yards and Gary Hayman added 31 yards on 7 attempts. Ahmad Rashad caught 5 passes for 68 yards and the two big touchdowns. For Oakland, Ken Stabler was successful on just 9 of 22 throws for 122 yards and had one picked off. HB Charlie Smith led the team with 64 yards on 14 carries while Clarence Davis was right behind at 61 yards on 10 attempts that included a TD (Marv Hubbard was held to 27 yards on 10 rushes and had the one key fumble). Cliff Branch caught 4 passes for 60 yards. “There’s more than O.J. on this offense,” summed up O.J. Simpson afterward. Buffalo lost to Miami in Week 2 but then ran off six straight wins before turning around and losing four of their last six to finish at 9-5 and second in the AFC East. It was enough to put them in the postseason for the first time since 1966 as a Wild Card entry, but they were soundly defeated by Pittsburgh in the Divisional round. Oakland lost only once more during the regular season, topping the AFC West for the fourth time in five years since the merger with a 12-2 record. They won an epic Divisional round game over the Miami Dolphins but came up short of a trip to the Super Bowl by losing the AFC Championship contest to the Steelers. O.J. Simpson’s injury was not serious and he returned to action the next week, although leg problems proved to be chronic and he had a lesser year than the record-shattering ’73 season. Still, he was a consensus first-team All-Pro and went to the Pro Bowl after rushing for 1125 yards. Joe Ferguson showed marked improvement in his second year, passing for 1588 yards with 12 touchdowns as well as 12 interceptions. 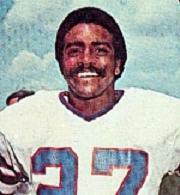 In his lone season in Buffalo, Ahmad Rashad had 36 catches for 433 yards (12.0 avg.) and four touchdowns. J.D. Hill remained the primary deep threat with 32 receptions for 572 yards (17.9 avg.) and six TDs.